Hello Sweet Cheer: Liebster Award - I've been nominated! 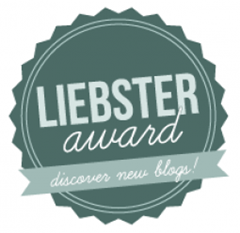 I'm super excited to post today because I've been nominated for the Liebster Award! I was nominated by Melissa who blogs at Al Forno Mementos! She is just the sweetest and is loyal to read every one of my posts! Thank you Melissa, you're the best! List 11 bloggers who have less than 200 followers (as best you can). Bloggers you believe deserve some recognition and a little blogging love! Post 11 questions for them to answer. Let all bloggers know that they’ve been nominated! >>I have three beautiful sisters, two of which are married! >>I'm a senior at Texas Tech University. >>Reality television is my weakness. >>Unlike most people, I LOVED high school and enjoy reliving it. >>I enjoy talking football and politics. >>My middle name is Michelle, making my initials MMM. >>I love dance (jazz, ballet, hip hop, contemporary). >>I LOVE adoption. I want to work in the field and adopt myself one day. >>I could live on cucumbers and sweet tea (not together). >>I've been to Haiti three times and am planning my fourth trip now! My happiest childhood memory would have to be Collier family vacation! For as long as I can remember my mom's side of the family would go to either the beach or the mountains every summer. It was always an exciting time to catch up with my cousins and have a little adventure! Who do you talk to every day? This is tough because it depends on where I am. I talk to my mom every day when I'm at home (and most days when I'm not) and I talk to my friends Abby and Erin every day when I'm in Lubbock! What do your family and friends think about your blogging? My family and friends are super supportive of my blogging! A lot of them are faithful to read my posts regularly and they know how much I love it! I've gotten really positive feedback from lots of people! What is the first item on your wish list? I would LOVE to have a nicer coffee maker! Maybe a Keurig or something! I have tons! But Duck Dynasty probably takes the number one spot right now! What is your go to dinner? Three favorite online shopping websites? If you could be anyone for a day, who would you be and why? I would be my sweet momma. Just so I could walk a day in her shoes, and maybe appreciate her a bit more than I already do! The best thing about blogging is the outlet that it gives me! I love being able to get my thoughts out in a positive way. The worst part is staying consistent even when I feel like I don't have much to write about! Why did you start and how long have you been blogging? What keeps you motivated to stay consistent in posting? Who is one person you are extremely thankful for right now? The book first or the movie first? What is your favorite sport (to watch or play)? What is one thing you would have on your bucket list? Describe yourself in two words. Hope you enjoyed this as much as I did! Go check out all these fabulous bloggers!! Hoping they'll do this post because it's a lot of fun to read! I love to talk football! Thank you SO much for the shoutout! I LOVE that you would be your mom for a day if you could. That says so much, I think, about who you are as a person. So sweet!